Price per 1x 36in length. BOXED: No. Tighten the wing nuts to hold in place. made with love by. Colour of tool may vary from picture. Add to Favourites. 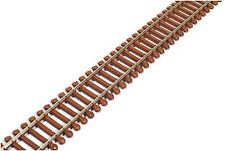 PECO STREAMLINE 5 x length of SL-100 flexible track WOODEN SLEEPER `00` Gauge Nickle Silver Rail. MINT BOXED. A great item for your collection. PECO STREAMLINE 12 x length of SL-100 flexible track WOODEN SLEEPER `00` Gauge Nickle Silver Rail Made in Great Britian. PECO STREAMLINE 8 x length of SL-100 flexible track WOODEN SLEEPER `00` Gauge Nickle Silver Rail Made in Great Britian. PECO STREAMLINE 5 x lengths of SL-500 flexible track CODE 100 0-16.5 Narrow Gauge 16.5mm TRACK IN 7mm SCALE Popular for modelling the famous narrow gauge railways in Wales ALSO KNOWN AS 0n30. PECO SL-1400. 1:87 HO-m SCALE. PECO SL-300 N SCALE Nickel Silver Code 80 Wooden Sleepered (25). The cheapest way of transporting will be chosen. Currently we have over 10,000 products available on line. TILLIG BAHN 85136. 5 Pieces, each 470mm Long - H0 GAUGE. PECO STREAMLINE 3 x length of SL-100 flexible track WOODEN SLEEPER `00` Gauge Nickle Silver Rail Made in Great Britian. TILLIG BAHN 85134. 5 Pieces, each 470mm Long - H0 GAUGE. made with love by. SL100F features a flexible moulded sleeper base respresenting the wood sleepers. PECO SL-100F. 1:76 OO SCALE. Make Supersized Seem Small. PECO STREAMLINE 1 x length of SL-100 flexible track WOODEN SLEEPER `00` Gauge Nickle Silver Rail Made in Great Britian. 1 is Peco. All are used condition. Part of one piece has rust coloured paint on the side of the rails. See the pictures for finer details. • 1 x 900mm (PECO). • 5 x 900mm (GT Italy). • 2 x 880mm (GT Italy). IMAGE FOR INFORMATION ONLY AS THIS IS A SET OF 9. Add to Favourites. Length; 914mm (36in). Used model railways & collections always wanted. How it started; I have been interested in model trains since I was a child. It was more fun and much cheaper, now I can fix most locos so they run like new. Peco Code - SL-100. Length = 1 yard (91cm).